UM, Miss Reeves? your um…phone, um it’s up-side…nevermind. Okay, so there isn’t an upside-down iPHONE APP -yet! It was still pretty cool for us tech savy folks to leap out of our couches Sunday night in the middle of sayin how hot Mrs Ari is to point out this little gaffe. 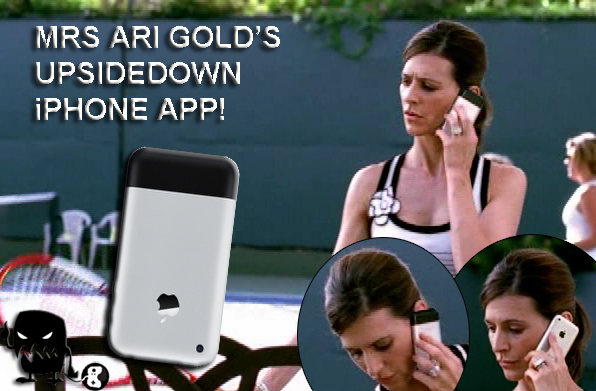 Could it be that Mrs Ari Gold (Perrey “that’s a lot of e’s” Reeves), was last on the planet, even later than Canada, to posses the Jesus phone? Probably not. Maybe, the Entourage gang was non-too-pleased about APPLE’s no freebie promo policy and thought Steve Jobs could use a sneaky F YOU!